MH CET 2019 MHT CET Admit Card Released!! MH CET 2019: MH CET is state-level common entrance test cell conducted every year by Directorate of Technical Education (DTE), Maharashtra State. The Government of Maharashtra, Mumbai will conduct MH CET this year also to give admission in various courses of Engineering, Pharmacy and Pharma. D. course. Latest Update: MHT CET 2019 Admit Card Released Today!! Download Admit Card from the Admit Card Section Below. 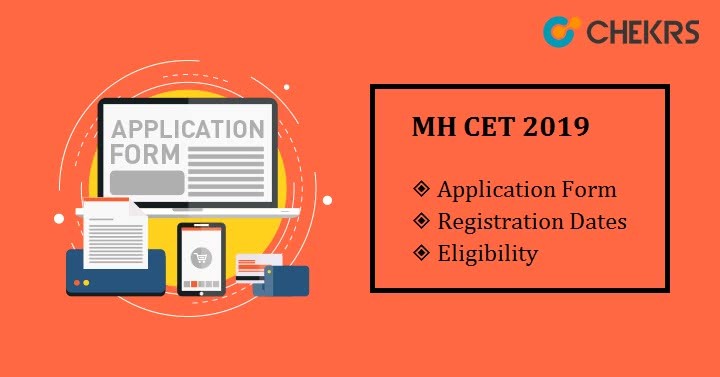 Latest Update: MH CET 2019 Application form Filling procedure has been started from 1st January 2019 (Today). Latest Update: MH CET 2019 Exam Dates have been released. It will be conducted on 2nd to 13th May 2019. Latest Update: MH CET 2019 Exam will be conducted through online (computer based) mode. Applicants can apply for MHT CET Exam and take admission in B.E./B.Tech, B. Pharma. /Pharma. D. courses. Eligible Candidates can apply for this exam and get admission in various government & private colleges of Maharashtra state. The Government of Maharashtra, Mumbai has announced the date of availability of MH CET Application Form. The application form is available online. Interested applicants can visit the official website and fill the form with the required details. Before filling the MH CET Application form student must register them to generate the application number and password. Visit the portal and register there to generate the application number. Log in with your application number and password to fill the application form. Enter the details required to fill the form. MHT CET Application Fee will be paid by online mode only. Is there any major changes in MH CET 2019? Yes, The Exam will be conducted through Online (CBT) Mode. How many compulsary Papers are for PCM group students? There are 2, PCM group students have to give paper 1 and paper2. Can other state candidates apply for MH CET Exam? Yes, other state candidates can apply for MH CET 2019 exam. Which Payment Mode are allowed to pay the Form Fee? Fee can be paid via any Online Payment mode. Here we are providing tentative exam schedules for MH CET exams. Dates are not confirmed yet so you can take a look at expected Dates of MH CET Exam Dates. We will update you with the actual dates soon after getting confirmation from the official website. Go through the important dates given here. Check the MH CET eligibility criteria before filling the application form. Only eligible candidate can appear for the MH CET Exam. So it is necessary to meet all the eligibility criteria given below. Minimum age should be 17 years. No limit for maximum age. Applicant must pass 12th/ equivalent exam from recognized board. Science and Mathematics are mandatory subjects for appearing candidates. Before appearing for MH CET Exam, a candidate must know the pattern of question asked in the exam, difficulty level of the question, time duration, total marks. If we know these all things already, it will be quite easy to attempt the paper. MH CET Exam Pattern is decided by the authority of technical education, Maharashtra. It may be changed. The exam will be conducted in CBT mode. There will 3 paper conducted separately for different streams. Paper-I will be of Mathematics, MH Paper-II will contain question from Physics and Chemistry and Paper-III will be of Biology. A total number of question asked from each subject will be 50. Total marks will be 300.Each paper comprised of 100 marks. Multiple choice questions will be there. Make notes and memorize regularly. Practice mock test to increase your speed. Go through the previous year sample paper. Take help of reference books. Make a plan and study according to it. The syllabus will be comprised of subjects like Mathematics, Physics, Chemistry, and Biology. MH CET 2019 Syllabus contains 20% syllabus from 11th class and 80% from class 12th. Students should go through the syllabus of JEE and NEET because MH CET difficulty level is same as JEE Mains & NEET. The topic wise syllabus is available on the official website of DTE, Maharashtra www.dtemaharashtra.gov.in. You can check the detailed syllabus of MH CET by clicking on the given link above and download it. MH CET Exam will be conducted soon so we are providing previous year question paper which helps you. Go through the previous year sample paper, know the pattern of questions asked in exam and prepare accordingly. We are providing previous year paper with answer to guide you and help you to score good marks in MH CET Examination. After successfully conducting the exam, the authority of the board of technical education, Maharashtra will release MH CET Answer Key probably in 1st week of June. Answer key will be published online. Applicants can check the answer key on the portal of DTE, Maharashtra and get to know their marks before the declaration of result. The Directorate of Technical Education, Maharashtra will declare MH CET Score Card in the month of June 2019. MH CET Result will be available online only. Candidates have to visit the portal to check their result and to download it. Applicant must enter their application number & date of birth after clicking on the link to download the result. The scorecard will contain score, rank in the state, category-wise rank. The Result will be declared within the week after the declaration of MH CET Answer key. MH CET cut-off will be decided by DTE, Maharashtra. According to the MH CET Merit List, applicants get admission in their choice of colleges or institutions of Maharashtra State. Candidates scored above or equal to cut-off marks will prefer first for admission procedure. Cut-off changes every year on the basis of factors like appeared students, highest marks, level of question etc. Visit the portal to check the merit list of MH CET.